We are a leading Manufacturer of dried meat jerky packaging, pig jerky packaging and pork jerky packaging from Vadodara, India. Swisspac India makes laminated bags and pouches to pack different type of jerky products, which helps to reduce oxygen going inside the packaging and keep hygiene. Product also prevents from fungus along with preventing evaporation of unstable components.Do not let atmospheric oxygen to penetrate into the package that stops the growth of aerobic bacteria. 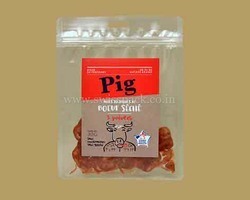 Pig Jerky Packaging is one of the most important types of packaging. It requires high accuracy and high technicality. Manufacturing cannot be packaged in ordinary plastic bags because bacteria and nitrates will form in the intestine and will spoil the meat. We offer you two options, pre-fabricated bags or bags with logo printing or design for your products. We have a distinguished team of graphic designers. If you do not have design or have an old design and want to change, we provide you with this service.Swisspac print the bags by using the advanced printing technology of the rotogravure which allows us to best quality print on your products in a many variety of 9 colors. You can also choose between the bright and soft bag. 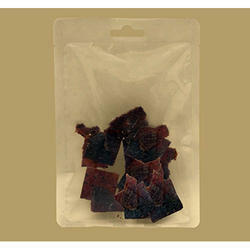 We are offering Pork Jerky Packaging to our clients.